Rare Finds is the series where we take a look at some of the exceptional cars on sale in the UK today. Expect classics, supercars and sometimes just a glimpse of the weird and wonderful. The only requirements are they have to be unusual, desirable and available to buy. 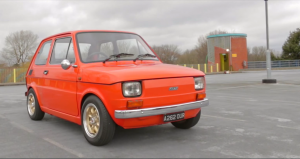 We test drive a modified Fiat 126. It might look small but it’s certainly mighty since Mike Jordan recreated it in its current Abarth form.